It’s a Christmas miracle…the binding is sewn on BEFORE Christmas! I really wasn’t planning on finishing up my Suburbs quilt for this Christmas, but Kathy sent it back to me this week so I have a bit to enjoy it! I just love the “stormy sky” and the straight lines in the houses and trees. It just adds so much character and movement to this quilt. Kathy is amazing if you need a quilter! 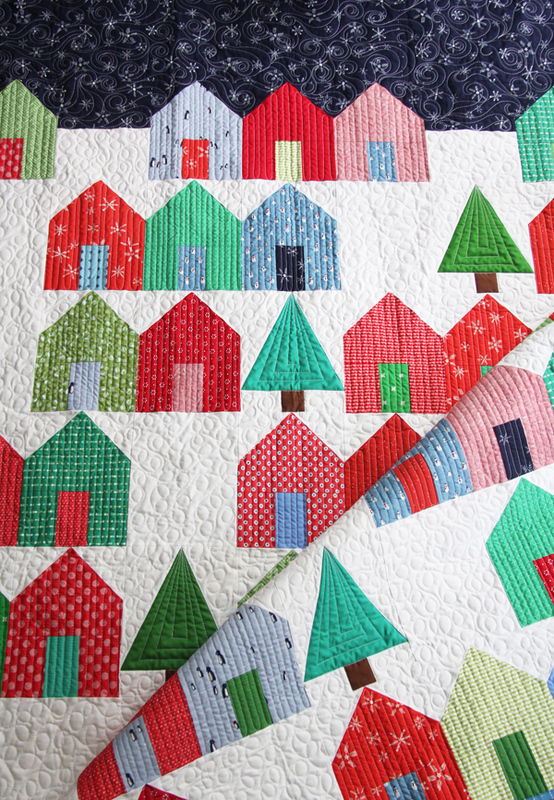 The pattern for this quilt is Suburbs, and I added a tree block which you can find as a free printable template here. It’s a fun, fast sew! There are more details about the fabrics in this post about the quilt top. Merry Christmas and much love from my family to yours! Terrific quilt! I love this pattern, your fabric choices, and the quilting. I bought this pattern, Allison, with the tree pattern too. I just love everything about you and your wonderful blog that inspires me. Thank you so much…and for coming to visit my blog! Merry Christmas to you too! Merry Christmas to your family!! 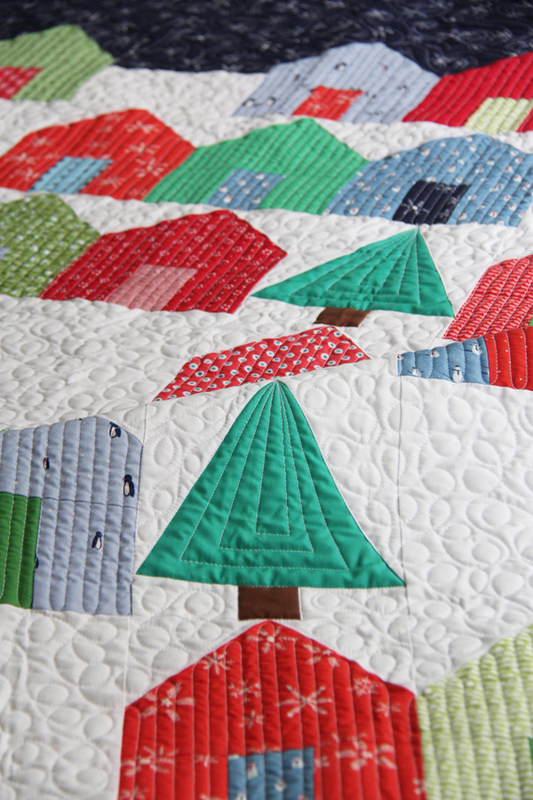 LOVE your Christmas suburbs quilt. I made this quilt too and picked up the mini pattern this summer at the Grand Rapids quilt show! Maybe I’ll make a Christmas mini for it :-). Thanks also for the tree pattern! 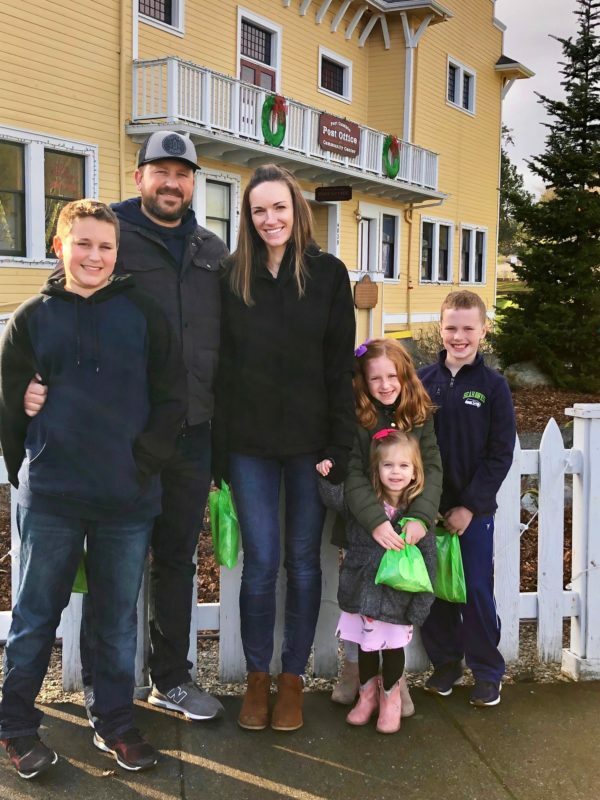 Enjoy your family…they are growing so quickly!! Thank you! A mini version of this would be amazing!!! What a beautiful family you have!! Merry Christmas!! Merry Christmas to you! Your eldest looks so much like your hubby!! gorgeous family! He does…they have the same personality too! ;) Thank you and Merry Christmas to you! Love your quilt, especially the sky! I hope you & your family have a wonderful Christmas! Lovely quilt! Merry Christmas to you too. Hope you all have a few wonderful days. 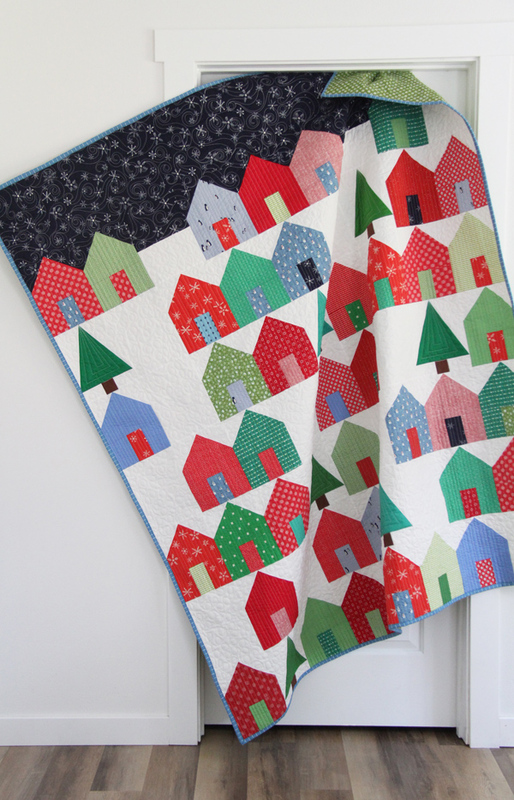 I am very partial to house quilts! I would love to see one or adapt one to incorporate southwestern houses. Pueblo style!! Your quilt is quite wonderful! Thank you for sharing everything you do. Your work is inspiring, as in get up and get something done (for me). Your colour (canadian spelling) schemes are very classy. And, you share pictures of your life, which makes you a real person to follow. Thank you to you and your family. Thanks Suzanne!! Happy New Year! The quilt is wonderful and you are right about what the quilting has added. Merry Christmas and Happy New year to you and your family. 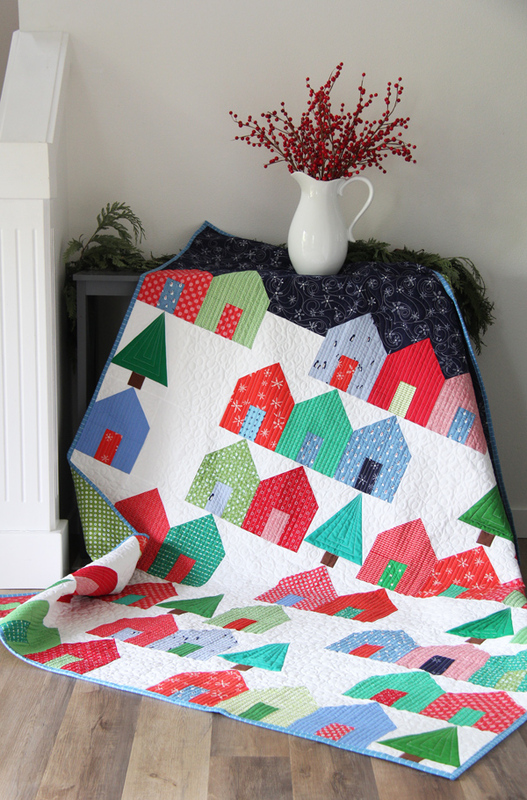 I love this…I’m just finishing up a Suburbs quilt and it’s a pattern I’ll go back to again and again, maybe next time with some Christmas spirit! Your babies are growing! What a beautiful family. Blessings in the coming year! Thank you! To you also!